This is me and Rita out in the high country ...well... the medium high country... that is, we were at 7500 or so feet. Colorado gets a lot higher. I am not sure at what point it is considered "the high country". I have lived here 15 years, but I will have to go ask a native. 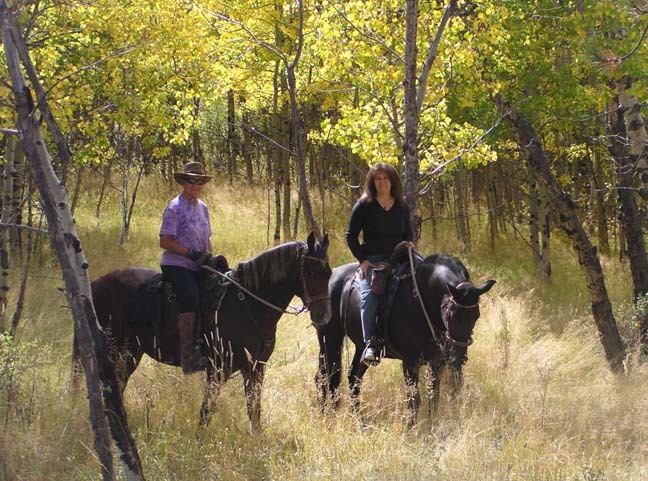 As I was saying, this is me and Rita out looking for the changing aspen leaves and we found some beautiful golden glades. Regarding altitude, I was raised at the beach. So even 6500 feet, where I live now, is high country relatively speaking. I have friends who live at 9000. That is high for a year round house... but still medium high for a hike. Well, upper medium high. 10,000 feet is "ridiculously high country" for a house, and perhaps the start of true high country. Above treeline is the "edge of space country". That's not my stallion I am on, that black gelding is "Midnight", one of Rita's Rocky Mountain Horses. And they really are great for this kind of ride. They are about 14.3, not too big, great for going around tree trunks and under branches. We were out for 4 hours. I'm sore. Colorado has dozens of "14ers", which are mountain peaks over 14,000 feet. I have not been to the top of one yet. I was on Trail Ridge Road, in RM National Park, which is close to 11 or 12 thousand feet. I was breathing hard up there. I was thinking the first 14er I would like to "do" is Pikes Peak... because you can drive up there, take a few sample breaths, and if it doesn't work out, you can drive back down real quick. I would probably not be a good candidate for any expeditions to find Noah's ark. That's supposed to be on a "17er". Are you experincing error while restoring authenticator app from a digital key backup? If you don’t know the techniques to restore the app, you can take assistance from the professionals as soon as possible by dialing a Blockchain phone number 833-228-1682. You can enjoy their services at fullest because you don’t have to pay for it. The professionals have solutions and remedies for every error that users face. They are active 24/7 to assist you. GoD and DoG is AVAILABLE!